A joint poster portrait telling the stories of Julia and Rae. With Rae Headrick. Instead of recounting each other's past stories or describing our present likes or dislikes, we decided to imagine each of our future to allude to who we are today. Each poster is a narrative composed of 5 snippets from our daily lives, set 20 years into the future. For Rae, the place she is at says a lot about her - all her individual stories start with "Rae @". For me, the people I am with says a lot about me and what I value - all my individual stories start with "Julia &". 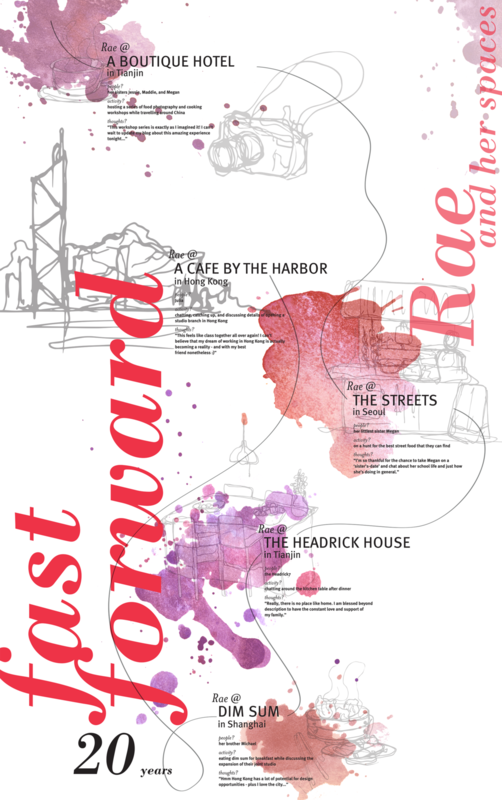 Our paths in the future eventually cross in Hong Kong, where we will be starting our own design studio together. We printed our posters on a transparent sheet, so that while each poster can stand as its own, the two can also overlap into one big poster, combining each of our stories into one. The two posters overlap into one big poster.